C2E2 was once again a wild and interesting time. As a newer author, the joy of C2E2 is in meeting up with other writers and geeking out together in our fandom. I love my fellow Harper Voyager Impulse peeps and we attended each others panels and generally supported each other - enjoyed a drink together after the festivities. My Panel was on Sunday, March 20th, and was on Sidekicks in literature and popular culture. It was a fun discourse between writers and was well attended. Was thrilled that fellow Impulse writer Lexie Dunne was on it with me. We signed books after - and then I was free to wander around drooling over the floor displays and admiring the excellent cosplay. Sunday is kid's day at C2E2 and there was so much joy in my heart watching all the beautiful girls portraying Rey from Star Wars. What a great, strong role model to see girls emulating! My husband and I enjoyed wandering around Chicago. I rewarded myself with some deep dish pizza and a visit to the Field Museum to do some research on my next series. All in all a fun weekend! I've added a new tab to this website. Click on Appearances and it will list the book panels, fairs and signings I'll be attending in the next year. Keep checking back and I'll add as get more information! Frodo wouldn’t have made it to Mordor without Samwise Gamgee, and Daenerys Targaryen owes her success to her fire-breathing buddies. Harry Dresden & Bob, Rachel Morgan & Jenks, and Batman & Robin--they work so much better together than separately. More often than not, sidekicks are the ones responsible for getting our heroes across the finish line, so join a panel of authors as they shine a spotlight on some of the best unsung heroes of SFF: the humble, yet completely essential sidekicks. Book signings after from 1:15 - 2:15 at the back of the showroom floor. I'll also be at the Ohioana Book Fair on Saturday April 23rd, the weekend after The World Weavers releases in digital! HV Impulse friends Laura Bickle and Alison Stine will also be there. Saturday, April 23, from 10 a.m. to 4:30 p.m. The Ohioana Book Festival is celebrating its tenth birthday, and you’re invited! Join us at the Sheraton Columbus at Capitol Square on Saturday, April 23, from 10 a.m. to 4:30 p.m. for a fun-filled day with more than 120 Ohio writers (including ten featured authors), panel discussions, a book fair, and more! The book festival offers something for every reader of every age—and it’s FREE! It has been over a month since my last post - sorry! I received the edits for The World Weavers and ended up rewriting much of the novel. Pacing is very important and it seems that WW lost much of it. I was trying very hard to cram in every bit of backstory about the characters and who they are, since this is the final novel of the series. As my editor Rebecca put it: "The fact that you know all this stuff about these people is awesome (and it was a treat for me to find it out), but your readers (sadly) don’t get to hear it all." I am thrilled to be able to post the cover for The World Weavers! I am really thrilled with this one - especially with the perspective between Djinn and Sulis. Love the dramatic lighting! Due out in digital 4/19/16! It has been a year since Sulis Hasifel fled to the desert, narrowly escaping death at the hands of a vengeful god. The time of the final battle, the final confrontation with the deities of her world, is nearing. Lured by the call of their long-trapped powers, the deities will descend upon the Obsidian Temple, where the Chosen await. But the war between gods and humans has enveloped the entire land. Sulis’s twin, Kadar, joins forces with the nomadic warrior tribes of the desert. Little by little, the desert armies draw the deities away from their stronghold in the north, towards their doom. In the face of a battle that will reshape mankind’s destiny and the face of the earth itself, old friendships will be tested and new alliances forged. In this spellbinding denouement to Desert Rising and The Obsidian Temple, Kelley Grant brings her epic trilogy to a thunderous and powerful conclusion. Cover Reveal for A.F.E. Smith! I loved A.F.E. Smith's first epic fantasy novel Darkhaven. I'm very excited that her second book is coming out in digital on January 14th. That's why I'm posting her beautiful cover to the sequel: GOLDENFIRE and a chance to win a copy of the book. Ayla Nightshade has ruled Darkhaven for three years. With the help of Tomas Caraway, her Captain of the Helm, she has overcome her father's legacy to find new confidence in herself and her unusual shapeshifting abilities. Yet three years ago, a discovery was made that could have profound consequences for the Nightshade line: a weapon exists that can harm even the powerful creatures they turn into. And now, that knowledge has fallen into the wrong hands. An assassin is coming for Ayla, and will stop at nothing to see her dead. It's a great Holiday gift for the fantasy lover in your life! In honor of National Cat day, I'll answer the question I often get - "Djinn seems so real - do you have much experience with cats?" Ohhh yes. My mother was a cat lover who could not resist a stray and took in all the cats that wandered up our country drive. I can't remember a period without cats purring on my lap, and I can't imagine living without them clinging to my curtains and clawing the sides of my couch. We decorate for the cats. I grew up surrounded by cats, dressing the tolerant ones up in doll clothes and dragging them into the stories I'd created. We had the Siamese cats Sam and Sindy. In Delroy we added Mama Kitty. When we moved to Ragersville more came along - Tigger, Patches, Boots, Cola, Jackie and Brynn. In college I adopted Chester, whom I've written about at length, and Cindy-Lou. I married and became step-cat-mom to Bart and Lisa. Right now we have five cats of various colors, sizes and temperaments. All are adopted from cat rescues or kindly veterinarians. Our oldest cat right now is Phoebe, who is 15 years young. She's one of those persnickety grey cats and is often quite disappointed with me as her minion. Too much ordering her off counters and not enough catnip and treats. Then came Willow. She was rejected by her mother at birth and bottle fed by a compassionate veterinarian assistant. She was tiny when she came to us. We learned not to bend over in front of her or she'd jump on our back and ride our shoulders - just like Amber in The Obsidian Temple. Then came Zoot. He was from the same Vet as Willow and was the friendliest kitten in the room. I liked his outgoing nature and brought him home. Please note: if you are inclined to be a crazy cat lady, do not pick a veterinarian who is also a kitten rescue. About a year after my beloved Chester passed away we adopted BIngley from the same vet. His mom was feral and he was more used to other cats than humans. He adores my husband, but I'm the clean-up lady he tolerates. And he loves, loves, loves Zoot - and Zoot loves him back. Seriously - it's hard to get separate pictures of them, but they are so cute I don't try. And last - we have Ember. She was taken from a high-kill shelter by a local rescue group and adopted by us a couple years ago. Bingley attempted to kill her for two months and then suddenly accepted her. We think that may be why she has turned into a supervillian. Yes she is the personality model for Amber in The Obsidian Temple. Yes, she knows she is gorgeous. Don't hate her because she's beautiful - hate her because she's delectably evil. You notice who got the prime window space in that last photo - 7lbs of pure cat-ness even the 14 lb Bingley doesn't mess with. So that is my crazy cat lady starter pack. I've realized that if I want to become a true CCL I'll need a bigger house to contain all the kitty litter boxes. So my couches and chairs are clawed, the curtains climbed, large catfur-bunnies float around the room and we never sleep in because the cats need fed. But I'm also never without a reading companion and on long winter nights I often have two or three cats warming my legs as I fall asleep to a comforting purr. I had a lovely welcome at the Dover, Ohio library by director Jim Gill. What a great place to hold a reading! It was a strange feeling – coming back to area I grew up in as a published writer. Having my 4th grade teacher and a 6th grade teacher come to the reading made it even more special. And I got to reconnect to classmates I had not seen in decades! Much love to everyone who came out. Hoping to reconnect again soon! As seems to be normal with Blog tours - there is at least one guest post I wrote that did not make it up. So I get to post it here instead! I have a restless mind, and meditation has helped me focus my energy and boost my creativity. We think of meditation as just sitting and trying to focus - but there are many ways to meditate. Here are a few of my favorites. In The Obsidian Temple, Sulis and the Chosen use various styles of meditation to calm their minds and channel magical energy to each other. While the Desert Rising series is fantasy – using meditation to enhance your creative energy is not! Here are five great ways to make your creativity flow and focus your mind. 1. Three-part breath meditation: Set a timer for 3-5 minutes. Sit upright. Have your spine straight, your head directly over your shoulders. Inhale deeply, and with your exhale, close your eyes, relax your shoulders. Imagine your breath as a wave coming in your body. Fill your body with the wave of breath, starting by filling the belly, then letting the breath rise into the chest and then sipping a little more into the collarbones. Exhale from collarbones to chest and use the belly to press out all the air. Fill yourself from the bottom to the top and exhale from the top to bottom. Continue for the full timer you set. 2. Writing meditation: Set a timer for five to ten minutes. Have a pencil or pen and writing paper. Put pen to paper and write everything that comes into your head, without stopping, for the allotted time. It can be just words, sentence fragments, or paragraphs, just don’t lift your pen and don’t stop! A great way to break writer's block! 3. If you are too restless to sit: a walking meditation. Find a long space indoors or outdoors to pace. Take off your shoes and set a timer for five to ten minutes. Very slowly place down the heel of the foot, then roll the foot down onto the earth, to the ball of foot and toes, feeling every movement. Shift you weight onto that foot, and then focus on lifting and placing the other foot. Feel every sensation as you walk your path. When you reach the end, slowly turn and walk back. If the mind starts to think about anything but the sensation of walking, bring it back to your feet against the earth. 4. Coloring meditation. You can simply open a box of crayons or colored pencils and a white piece of paper and let your hand and eye choose your pattern. Or you can search online for mandala patterns and print one out (there are even mandala coloring books available!). A mandala is a circular matrix with a center point—a point from which all things are possible. From this center comes forth great possibilities and potential. When you color mandalas, you’re expressing your desire for healing and wellness. 5. Find a yoga or Tai Chi class online or in your neighborhood and dedicate some time to those mindful practices. Both of these forms of moving meditation quiet the mind and calm the body. The dances Sulis and the Chosen practice are a combination of the two forms. Even five minutes a day of meditation can be a great energy and creativity boost! Book Loft meet and greet! Had such a great time meeting and signing books at The Book Loft of German Village! Got to meet Misty, the wonderful blogger from The Top Shelf and many other wonderful readers! Thanks so much for everyone who came and bought all but two of that big pile of Desert Rising Paperbacks! Planning more get-togethers when The Obsidian Temple comes out in paperback - watch the website for more information. 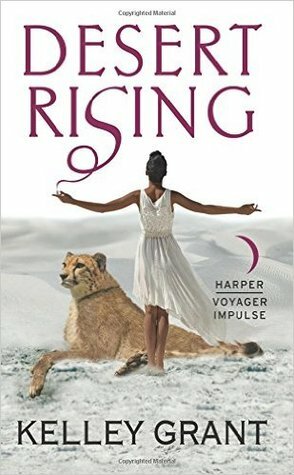 In honor of The Obsidian Temple's release on Tuesday, I've decided to do a giveaway of two signed copies of Desert Rising on Goodreads! They won't let me post about digital offerings - but the winner will also receive one of the FREE digital downloads for The Obsidian Temple I get from Harper Voyager! Enter Now - it is only a 7-day window! Giveaway ends July 25, 2015. The Obsidian Temple releases next Tuesday! Squeee!!!! Desert Rising is just $.99 right now as a promo. I have a blog tour going on. Find it here: The Obsidian Temple Blog Tour. I’m proud that I’ve followed my passions throughout my life, from teaching and owning a yoga studio to getting my novels published. Not everything has been a success, but I’m proud that I don’t give up. It can be hard to stay true to your heart. I grew up in a working class household and learned that if you want to succeed you have to work hard and finish what you started. That has given me the discipline to sit down and write every day, set my own schedule and stick to it until the end of a project. I always acted out elaborate stories I made up with my dolls and toys, as a kid. I began writing them down for assignments at school and teachers loved them. Praise is addictive! Through reading thousands of books. I read and reread everything I could get my hands on as a kid. I love getting engrossed in another world. When I started writing I realized that was an even better way to leave this world and enter another – by creating the worlds and letting my imagination go. In college. As a child, I didn’t know anyone who was a writer and didn’t realize that they could be shy, country girls like me. College widened my horizons and I met creative, introverted people like myself who had the same love for the written word. I love connecting all the words together to make sentences, and sentences to make paragraphs and paragraphs to make chapters. It is fun for me. I love the challenge of getting that daydream, that imaginary leap, down in words so that it reveals my creative vision. Fantasy. I love to write about new worlds and heroic quests. I had an entire world in my head I needed to write down. And it was way too big to fit in a short story so I had to start mapping things out, putting down the characters as they spoke to me, getting down the worldbuilding. The novel came from there. I’m pretty sure my five cats used their mind control to create the great temple cats in the Desert Rising series. Turning off the self-criticism so the words and ideas can flow. I have to turn it back on to edit – but having a constant negative voice kills the creative process and makes for bland, boring writing. How to write on a deadline. I wrote this book to contract and learned how to keep creativity flowing on a tight schedule, which would allow editing and revision before turning it in to the publisher. Writing the middle book of a trilogy was also a challenge – creating a book that was whole in itself, while building excitement for the final book. Yes, at least part-time. I’m also a part-time yoga teacher, and the two careers seem to blend well together, with teaching forcing me to come out of myself and be around other humans and writing giving me the introvert time I need. My creative worldbuilding abilities. I love creating new mythologies, new religions and imagining new lands and can create a world for the reader that feels as real as the one they are standing in. I am great in a crisis. I keep my head, work quickly and resolve the situation to the best of my ability – often before anyone else has even begun to think. I have Seasonal Affective Disorder – so tend towards depression and negativity when stressed. I would like to be a more positive, present moment centered person.